Making - and more significantly, maintaining - the lifestyle changes deemed necessary for alleviating menopause symptoms can be tricky. However, there's one remedy for hot flashes that can appear as more of an indulgence than a chore: the regular drinking of tea. The complex question of "to tea or not to tea," however, arises amid sometimes contradictory menopausal guidance. Some women following advice that hot drinks trigger hot flashes might avoid tea altogether, while others may have heard that herbal infusions can alleviate symptoms. 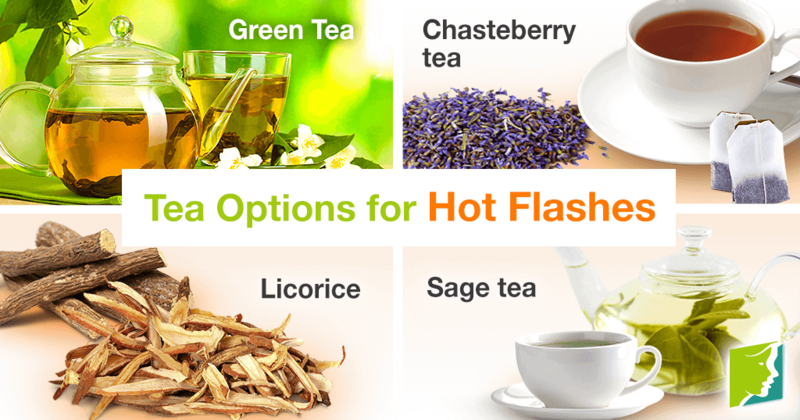 How Can I Use Tea as a Treatment For Hot Flashes? Many traditional herbs and spices - like black cohosh and ginseng - can be steeped in hot water and brewed into a holistic tea. To enhance the benefits of this time-honored custom, it is generally advised to take tea several times a day over a prolonged period. If hot beverages trigger hot flashes for you, these teas can also be enjoyed chilled or iced. What Herbs Are Good for Making a Tea for Hot Flashes? Lauded for its multiple beneficial properties, weight loss included, green tea - the one true tea - contains antioxidants and other nutrients. The ancient tea has also been shown to reduce the intensity of menopausal symptoms such as hot flashes. When chasteberry is consumed as an infusion, it is considered to have the most effect on menstrual irregularities and related symptoms caused by low progesterone levels. Treatment is said to take effect between 4 and 12 weeks. Adverse reactions, however, can include alterations to the menstrual flow. This tasty estrogenic herb is not just for kids and cough medicine. A couple of cups a day will help stabilize your hormone levels and, in turn, alleviate hot flashes. Sage is great at targeting menopause symptoms triggered by low levels of estrogen. If you've got some in the pantry, steep a few leaves in hot water for a quick hot flash treatment. This is by no means an exhaustive list of the herbal teas that can help combat hot flashes. However, some estrogen-replicating herbs like black cohosh and dong quai also render the body unable to produce its own estrogen when taken over extended periods. It's important, therefore, that you conduct research into possible side effects before using an herbal tea to curb hot flashes. Learn more about managing hot flashes effectively. Even though hot flashes are bothersome, remember that you're in control. Find herbs and nutrients, for relief from body heat here. Although hot flashes are typically associated with menopause, hot flashes during pregnancy are also common.